Preheat the oven to 450 degrees. Tear off 4 large sheets (18 by 12 inches) of heavy-duty aluminum foil, and lay each piece on your workspace. Divide the leeks, carrots and snow peas into 4 equal portions, and place a mixture of each onto each sheet of foil. 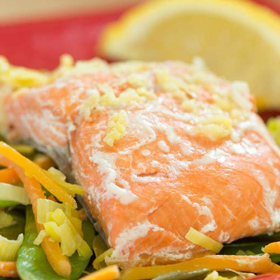 Top each mound of vegetables with a piece of salmon. Sprinkle 1/2 teaspoon of ginger on each piece of fish, and drizzle each with 1/2 tablespoon of vinegar and 1/4 teaspoon of sesame oil. Fold the foil to form a packet around each piece of fish, leaving enough room for heat to circulate. Roll the edges to seal tightly. Place the packets on a cookie sheet and bake for 20 minutes or until the fish flakes easily with a fork. Meanwhile, place the spinach leaves in a microwave-safe bowl or platter. Drizzle the greens with fresh lemon juice and the remaining sesame oil. Heat the spinach in the microwave at high power for 3 minutes, checking every minute to make sure the spinach is tender but not overcooked. Divide the greens equally among 4 plates. When the salmon is cooked, open the packets carefully to allow the steam to escape. Empty each packet onto each of the beds of spinach. Garnish each plate with a lemon wedge and serve. Each serving provides an excellent source of vitamin A, vitamin C, folate, magnesium and potassium and is a good source of calcium and dietary fiber. Serving size: 1/4 recipe. Amount per serving: 256 calories, 7.8g total fat (1.2g saturated fat), 59mg cholesterol, 20g carbohydrates, 27g protein, 5g dietary fiber, 145mg sodium.